Before John Carpenter remade this Howard Hawks produced film in 1982, he paid tribute to The Thing from Another World in his 1978 masterpiece, Halloween, and with good reason: over fifty-five years since its release, the film still stands as one of the most effective horror films ever made. 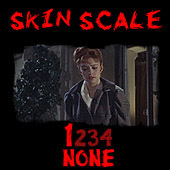 Charged with a 1950s subtext of fear and paranoia, the film stands as a clinic in mood, tension, and atmosphere that few films have achieved since its release. 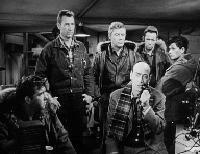 Adapted from John W. Campbell’s novella “Who Goes There?,” Hawks's production is concerned with a team of military and science personnel at a remote arctic outpost. 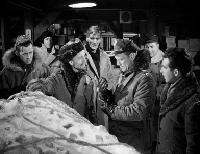 After confirming evidence of a nearby aircraft crash, the crew, headed by Captain Hendry, investigates the site and finds a real flying saucer trapped beneath the ice. After planting some thermal charges in an attempt to thaw out the spacecraft, the crew accidentally destroys it instead. 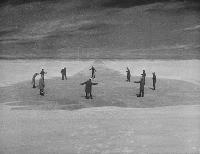 All is not lost, however, as they discover a body frozen nearby in the ice. Upon a close inspection, it's clear that the ship's pilot is not from Earth. 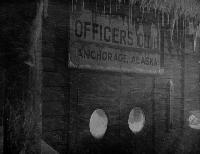 Astounded by their discovery, the crew takes the body (still frozen in a huge block of ice) back to their outpost. It’s here that we first see the true conflict of the film emerge, as many of the scientists, particularly Dr. Carrington, want to thaw the creature out immediately. The more level-headed Captain Hendry, however, waits for orders from his superiors. This rivalry between science and military will be a thread that runs throughout the entire film, as one starts to wonder if the characters pose the biggest threat to each other here. This, of course, is a long-running staple of horror, and one that George Romero has utilized several times; interestingly enough, Romero would even mimic the scientific/military dichotomy in Day of the Dead. Soon enough, however, our group is left with no choice to confront the alien being they’ve found, as one of the guards gets too creeped out by the creature and decides to cover it up with a blanket. Unbeknownst to this guard, the blanket is an electric one that begins to melt the block of ice. Oops. 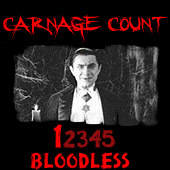 This leads to the creature being released upon the compound and its surrounding areas. We immediately discover that this is a vicious, relentless creature when he attacks a team of sled dogs. One of the dogs manages to tear his arm off, but he just keeps on ticking and retreats into the snow. The crew at the base recovers the severed arm and begins to learn more about our creature. Apparently, though humanoid in appearance, it actually bears more resemblance to plant life, as it is able to regenerate cells and lost tissue. Dr. Carrington knows they have stumbled upon something revolutionary here, and he immediately wants to re-capture and attempt to reason with the monster. As is to be expected, Hendry isn’t too wild about this idea and wants to destroy the creature before it can cause anymore difference. 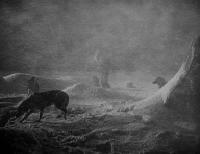 Thus, the film becomes a struggle between the two characters’ ideologies. 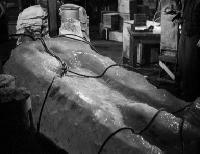 Ultimately, it becomes all too clear that Carrington can’t be trusted, as he begins to covertly experiment with the creature’s remains. As if the characters didn’t have enough on their plate, they now have to deal with a dose of paranoia that pervades the entire narrative from this point on. While this element of the film isn’t nearly as prevalent as it is in Carpenter’s interpretation, the film is clearly playing on the paranoia of the Cold War, as both Carrington’s shady behavior and the monster play on the fear of the unknown. 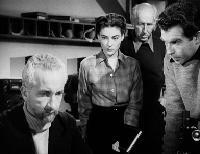 Furthermore, the film reflects the age’s fear of the destructive potential of science: Carrington is clearly portrayed as the bad guy here that blindly pursues knowledge without regard for the consequences. Such a motif clearly finds its origins in Dr. Frankenstein. This is not to say that the humans are the most destructive force here, as the monster actually reveals itself to be a powerful force, as it relentlessly assaults the Air Force compound. Though modern audiences aren’t likely to be terrified by James Arness’s monster, the mystery surrounding the creature effectively builds suspense and mystery. Once he’s finally revealed, the monster itself also reminds us of the creature from Frankenstein, as it lurches along and violently attacks anything in its path. However, the element of sympathy that we find in that story is absent here, as the film makes it clear that the monster has no remorse and cannot be reasoned with; thus, the crew must devise a plan to destroy it. 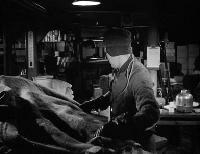 The Thing from Another World might seem more like a science fiction film than horror, but the film clearly plays upon themes that horrify us. 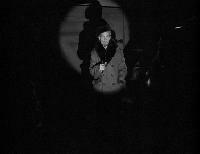 Chief among these is the fear of the unknown, as the film is an ominous account with an entity that cannot be understood. Though the film is clearly rooted in the underlying fears found during the decade of release (the 50s), this fear is universal. The film also preys upon the fear of isolation, as the characters are literally stranded in the middle of nowhere with an alien from another world. From this description alone, it’s easy to see why the film is still relevant half a decade later. Though our national obsession with extra-terrestrial life has subsided a bit over the years, everyone is intrigued by what they don’t understand. The film does not simply rely on a deceptively simple plot for its effectiveness, as the film’s direction is superb, as the film moves at a brisk pace throughout. There’s never a boring moment in the film, even when the monster isn’t around. This is accomplished by the excellent characterization and dialogue found throughout the film. Considering Howard Hawks’s involvement in the film, this isn’t a surprise, and it strengthens the film as a whole. The characters aren’t merely fodder here, as each serves a distinct purpose and causes you to care about the plight. Even the villainous Dr. Carrington isn’t a simple one-dimensional character, as he comes off more as a misguided, well-intentioned soul rather than a conniving, evil genius. A comparison between this version and Carpenter’s The Thing is inevitable. Though I prefer Carpenter’s version, this is not to denigrate Hawks’s production here, as the two are wildly different animals representing variations on the same theme. 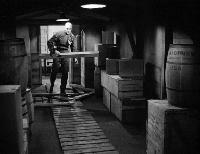 The Thing from Another World isn’t nearly as bleak as Carpenter’s version, but I do find it every bit as ominous. The antiquated nature of the film and its 1950s undertones contributes an almost apocalyptic tone to the film, as it truly captures the feeling that the world could end at any moment. Even when the threat of the film is resolved, we’re still left with the ominous warning to “watch the skies,” a line to which Carpenter would pay tribute in his 1980 film, The Fog. 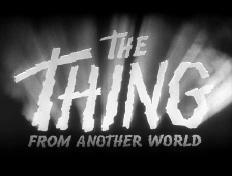 Over the years, The Thing from Another World has earned its status as a horror classic; furthermore, it has earned its place in my annual Halloween viewing season. For a multitude of reasons, this film effectively captures the essence of a “horror film,” as its tension, mood, and atmosphere still manages to send a chill down my spine. This film proves that effective horror is possible without blood and gore (not that there’s anything wrong with those, of course). Luckily, Warner Brothers has treated the film well on DVD as far as presentation goes. Presented in its original academy aspect ratio, the transfer is crisp and captures the black and white contrast very well. The original mono audio track is also clear and reproduces all of the dialogue well. Best of all, this disc can now be found for less than $10 at most retailers. Therefore, you have no excuse not to run out and buy this one now. Essential!